Government and Muslim Brotherhood sources have both confirmed that talks have been taking place between Egypt's ruling Supreme Council of the Armed Forces (SCAF) and the Brotherhood within recent days with the aim of discussing post-election cooperation. 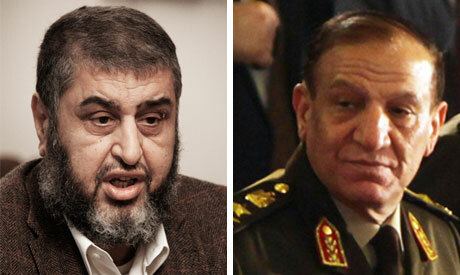 At one of the meetings, sources said, Brotherhood second-in-command Khairat El-Shater met with his SCAF counterpart Sami Anan. Other contacts have reportedly included phone calls and wider meetings. Talks are reportedly aimed at fostering cooperation between the two sides on a range of issues, including management of the state following the election of Egypt's next president. These consultations, according to one Muslim Brotherhood source, "have been very useful in settling ongoing disagreements over the composition of the Constituent Assembly," which is responsible for drafting a new constitution. The assembly's membership was only finalised on Tuesday after weeks of squabbling between Parliament's Islamist majority and non-Islamist parties and figures. The agreement gives half the assembly's 100 seats to MPs representing the Brotherhood's Freedom and Justice Party and the Salafist Nour Party, while the other half is reserved for non-Islamist figures, including individuals representing certain state bodies, Al-Azhar and the Coptic and Anglican churches. The formula, however, fails to include many representatives of the civil mainstream, and has therefore drawn considerable criticism and prompted several walkouts by non-Islamist assembly members. Unlike the composition of a previous Constituent Assembly that was drawn up some two months ago and later annulled by the SCAF, the makeup of the current assembly has met with the approval of both the SCAF and the Brotherhood. Recent meetings between the two sides reportedly aim to widen the scope of this agreement. The Brotherhood leadership, according to sources who spoke to Ahram Online, is hoping to clinch the top position in the next government, should Mubarak-era premier and presidential finalist Ahmed Shafiq beat Brotherhood candidate Mohamed Morsi in this week's runoff vote. "Deep down, nobody is expecting Morsi to win; it has become very clear that the SCAF is supporting Shafiq," said a Muslim Brotherhood source. "We don’t want to get into a confrontation, but we want to make sure that Shafiq won't be running the state in the absence of revolutionary forces – this is why we want a strong presence in the next government." A former associate of El-Shater who previously defected from the Brotherhood told Ahram Online: "Khairat El-Shater is a realistic and pragmatic man. He knows that Morsi's electoral prospects are slim, and that the chances of the Brotherhood making its presence felt will be much better if it comes via the government rather than the presidency, in which case Morsi would be confronted by all top state bodies, including the SCAF itself." I think Mursi will win, I know you don't like it, but all your previous predictions and polls proved highly tendentious and wrong. You must learn to be objective and separate your emotions from reality.